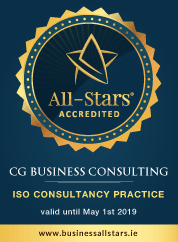 Your organisation could benefit from a FREE ISO 50001 Consultation with CG Business Consulting. How will ISO 50001 benefit your business? What is ISO 50001 Energy Management System & do you qualify for a grant? ISO 50001 is suitable for all businesses regardless of their size or industry but it is particularly effective if the business operates in an energy intensive industry or one that faces greenhouse gas (GHG) emissions regulation or legislation. ISO 50001 formalises energy policies and objectives and embeds them into energy efficient thinking throughout the organisation. It is estimated that the ISO 50001 Energy Management Standard could have a positive impact on some 60% of the world’s energy use by providing public and private sector organisations with management strategies to increase energy efficiency, reduce costs and improve energy performance. Effective energy management should be a priority focus because of the significant potential to save energy and reduce greenhouse gas (GHG) emissions. The main benefits to the company are reduced costs, improved business performance and a greater level of control. ORS and CG Business Consulting work in partnership in the delivery of ISO 50001. They guide you through the complex Enterprise Ireland grant application process. Through their combined skills, they work with clients to implement successful energy management systems and achieve certification for a variety of companies operating in a wide range of sectors. ORS is a full service firm of engineers and construction specialists. The firm has a strong energy management team, with a proven track record in energy savings for some of Ireland’s largest corporate businesses. With offices in the East and West of Ireland, ORS has nationwide reach.